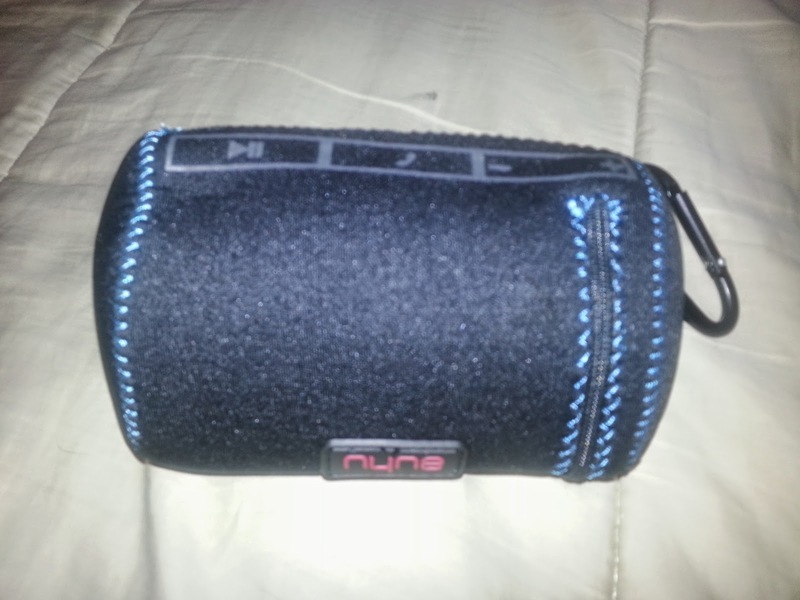 I recently had the chance to review the Mini Bluetooth speaker from Nyne. It checks in with a size of 5" x 2.5" x 2.25" (W x D x H) at just over half a pound and retails for just under $50. It comes in four color combinations, black and blue (above), black and silver, black and green, and a more feminine looking white and purple. It has a playtime of 10 hours and a range of 33 feet. Enough on the specs. Nyne's target audience for the unit appears to be the much younger teen crowd, as its included carrying case comes with a carabiner for attaching to backpacks and size-wise is perfect for them to carry around. The idea being teens can share their tunes more easily while on the go. The case is supposedly splash resistant, though I didn't test that aspect. I can also envision it being attached to diaper bags where mommies can soothe their baby with some music through the speaker instead of their phone. When I first opened the box I was really scared. It had two sets of instructions that were really big. I'm thinking, what in the world does this thing do so special that it requires instructions so big? After scanning the instructions, I quickly realized their size was because they were available in so many languages: EN, DA, ES, FI, FR, GE, IT, JP, KO, NL, NO, PT, RU, SV, and ZH/CN. The instructions in each language weren't that long, the size of each booklet just had 15 languages in it. The first booklet was a Quick User's Guide. The second was a Safety Guide. The only thing I needed the instructions for was for starting manually pairing with my phone. Supposedly it goes into pairing mode automatically when turned on if not already paired but I waited too long to scan from my phone. While I certainly played with the unit, I also let my son use it. His first comments were how the sound out of the unit was so much more clearer than what he was accustomed to coming out of the phone. I have to agree. Teens will definitely approve as the size is perfect for sharing where ear buds aren't appropriate. The audio quality is amazing for something so small. It comes with a micro USB cable and 3.5mm audio cable. I can't think of why someone would use the direct cable but I guess if your device doesn't support Bluetooth, you have a way to use it. It does only support Bluetooth 2.1 though. For a device so new, I would have thought it would have supported a newer version of the Bluetooth spec, specifically the high speed support of 3.0. Did I notice any sound degradation because of that? No. 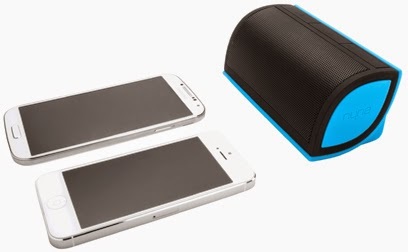 The speaker can be used as a speakerphone as it has a built in microphone. Size-wise it is very natural to use to speak into. It will pause your music when the call comes in, but I believe that is more a function of the phone than the speaker. I can't imagine teens purposely setting up the speaker to be used as a speakerphone, but if a call comes in while they're listening to music, they won't have to run and grab the phone to talk to mom or dad. If you think the size is too small, Nyne has other Bluetooth speaker models available. Aqua is their watertight model. Bass is a tabletop model. TT is their adult portable model with a noise-canceling microphone, perfect for travel. Cruiser comes with attachments for a bicycle or stroller. They have a Royal series coming out this fall which looks like a fancy upgraded Cruiser line. I really like the sound quality of the Nyne Mini. I think it is perfect for their target audience. The colors are stylish and the unit is compact enough to be easily lugged around without much hassle. At just $49.95, it should do well out there in the market. Great job.